How Far Will the Virginia Flaggers Go For Attention? Update: Brandon Dorsey and the Stonewall Brigade (SCV) is now demanding that W&L apologize to the individual who was supposedly harassed by police on campus this past Saturday. Not a shred of evidence has been presented substantiating the accusation. I’ve already said that yesterday’s protest in Lexington, Virginia over the removal of replica Confederate flags will likely lead nowhere. The Virginia Flaggers know this which is why they have now gone to great lengths to stage another conflict to garner sympathy for their cause. Earlier today a comment was left purporting to be that of a student at Washington & Lee University. As a student of Washington and Lee University, I witnessed today’s events with disgust. All those hateful racist white people waving their evil symbols in my face. I saw a teenage white boy trying to walk on campus wearing a shirt with a confederate flag on it, and I demanded the police stop him. They went over at my request, surrounded him, and told him to either turn his shirt inside out, leave, or face arrest. The white boy began to cry! Haha. After the police pushed him twice, he slowly took his shirt off and turned it inside out and put it back on again. I was so proud the police did that for me, because it is my school. I go here and the white boy doesn’t. I followed him closely and he walked over to the Chapel and took a photograph of that dead horse Travellor. He saw me behind him and he ran away. Today was a great day for us and the Committee. I thank you, Mr. Levin, for all you do to help us remove all this Confederate racist and terror symbols. I was suspicious of the comment given that the author did not use a W&L email address and later I learned that Jonathan Till is not a student at the university. Even more suspicious is that while campus security was on patrol the police were not on campus yesterday and a W&L student would know the difference. What connects this comment to the Virginia Flaggers is a Facebook post that appeared on their page earlier today. As you can see there is something very suspicious about this Facebook post, which has now appeared on a number of other heritage Facebook pages and has garnered the typical comments in response. I would venture to suggest that the author of the blog comment and this post is the same person. We’ve been here before, but this little fabrication takes the cake. I’ve seen someone use that screen name before. I just can’t remember where. I’ve never seen it. I pinned this on the Flaggers because they were the first to post it on their Facebook page. Shortly thereafter it appeared at the Virginia War Between the States Sesquicentennial page, Southern Heritage News & Views, and Southern Heritage Preservation Group. Well, I swannee!! I am not surprised. Sorry I have nothing more sensible to say. Good detective work. Thanks. With a little help from a couple of very reliable sources. Is the spelling & grammar equally inconsistent? Flager? Travellor? The spelling is inconsistent, but this could be sloppiness on the author’s part. Jonathan Till has a rather interesting Facebook profile; assuming that it is one in the same. Regardless of who wrote that above, it is unlikely that the VA flaggers will address such pettiness. Did they ever address Amanda? I have no idea and I can’t even be sure that the author of the comment is responsible for the post. Either way the story is likely fabricated. There is no way to corroborate the story since no names are used and there were no police patrolling campus on Saturday. I don’t think the authors are the same. I think it’s likely someone read the comment on the VA Flaggers page, saw the note about turning the shirt inside out, and fabricated the rest. I’m not entirely certain that the “recollections” of the 15 year old are honest either. The VA Flaggers have a habit of positing stories as fact, which are in reality fabrications. Rob Walker Jr. anyone? I’m not entirely certain that the “recollections” of the 15 year old are honest either. There is no way to tell and as I’ve already said there were no police patrolling campus on Saturday. Remember when Susan Hathaway and Tripp Lewis were caught spreading what turned out to be a fake police report about vandalism on Monument Ave. all over the internet? Even if VaFlaggers didn’t manufacture this and learned it was another “Southron” supporter, they would never admit the mistake. The apparently fake story makes great propaganda to whip up their peeps. And now that fake story is spreading. I’m hoping Till wasn’t stupid enough to use the email address set up specifically for his campaign for Commander of the Georgia Division – but that might be giving him too much credit. Yes, apparently he is that stupid. Why in this flagger fairy tale does the white boy run away when he sees a black person? Is this what all little flaggers are taught to do? You can’t make this stuff up. I did notice that listed at the end of the post is all of the same addresses and contact info that was listed in postings that I recall seeing by the SCV prior to the event. If this is proven to be a hoax… Oh boy. Is this confirmed? so is it a bit a of “black face” minstrelsy … if it is its certainly offensive and and the best one can say – if there were no malign intent – is that it is maladroit and naive and it certainly does not do justice to their desire to see Lee appropriately honoured. I make no claim to knowing who this is, but I do find it curious that this story contains not a single name for verification. Surely this child was not walking alone through campus. My bad, Kevin, my response sort of assumed that the writer of the first hand account on Facebook and the strange posting on your blog were one and the same person but given that the first hand account has been widely copied nearly 200 times and liked 600 + times – it is widely seen and anyone who read it could have been “inspired” to troll and write on your blog to cause trouble or vent in “blackface” – as the original story of the 15 year old is so widely distributed – it could have been someone belonging to a page/group other than the Virginia Flaggers. To post in such a self conscious manner is nearly creative/queer/indie/jamming if it were not so offensive. Its riven with anxieties about masculinity – note the repeated emphasis on the “white boy” crying and running away – perhaps we should be sorry for rather than angry at the person who felt so threatened – sadly being offensive is going to erode rather than grow support for accepting confederate visual heritage/imagery as part of a multi layered visual public space experience. Not a problem. I speculate that they are the same author in the post, but I agree with you that it could have been anyone trolling. The story was most likely fabricated. It is interesting how often minors are the centers of these stories. Again, no names are mentioned in the FB posts so there is no way to corroborate the story. 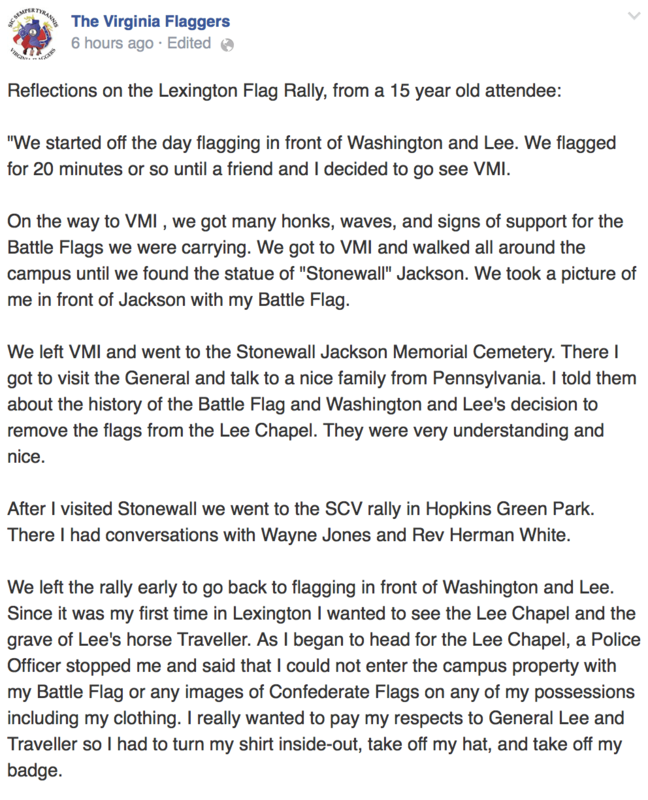 I wonder what Lee would think about suing such tactics by those professing to be defending his memory…. He would say there is no honor in this. Kevin, can you account for your cyberwherabouts when these posts went up? Yes! Of course! I knew it! And the IP address was located in Portugal!! Nicely played, K-Lev; nicely played. A local TV Station has this on their FB page and website! I guess reporting the news simply means passing along information. Pathetic.